One week ago, I was asked to go to the world premiere of Night at the Museum: Battle of the Smithsonian as a member of the press and take pictures of the celebrities as they walked the red carpet. We were asked to arrive over two hours prior to their arrival, so in order to curb our boredom, we received a lengthy press release detailing some interesting information about the new film. In it, Shawn Levy, the director, talks about how they approached the sequel, saying, "Ben Stiller and I had always agreed that we wouldn't continue this tale unless we had a great new story - so when the idea came up of taking Larry and his friends to the Smithsonian, we knew this was it." Great. Too bad that's not a story. That's a location. 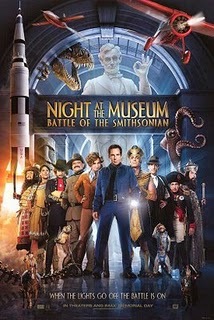 And that is the fundamental problem with Night at the Museum: Battle of the Smithsonian. While the original was certainly no masterpiece, it at least provided a decent enough story. It wasn't simply locked into the museum setting. It dealt with problems outside of that sliver in Larry's (Ben Stiller) life. He was a divorced father who was desperate to win the affection of his son who was about to get a new stepdad, a successful Wall Street bond trader. It also gave him a love interest in the form of Carla Gugino, who was skeptical of his ramblings about the exhibits coming to life. Sure, the movie might not have been the imaginative escape we all hoped it would be, but it had depth. The sequel has none. It's merely a CGI spectacle with little regard to narrative. In this movie, the exhibits are being moved from the American Museum of Natural History to the Smithsonian for permanent storage in the federal archives. Although the Tablet of Akmenrah, the magical stone that brings all of the exhibits to life at sundown, was supposed to stay, one of the monkeys stole it and took it with him to the Smithsonian. As you would expect, this brings everything to life, including Kahmunrah, a Pharaoh who has stolen it in order to unleash demons of the underworld and become ultimate ruler. The great thing about this Night at the Museum sequel is that it has free reign to travel through the Smithsonian, a chain of 19 museums, which could have resulted in endless fun. Disappointingly, it stays secluded to a small portion of that area, mostly in the underground archives, which takes away a lot of the enjoyment of exploration. Still, the film does manage to show a hint of creativity when the pictures and paintings come to life. When Larry and Amelia jump in the famous photo of the sailor kissing a woman in celebration of the ending of World War II, I was thoroughly charmed. It was clever, fun and promised of brighter things to come. What fun it would be to see these characters jump in and out of famous paintings, living through those universes imagined by some of the most artistic minds the world has ever seen. Surely the filmmakers would relish in this opportunity. Nope. After this one brief stint, the film reverts back to running amuck through the halls of the storage facilities, abandoning any chance of keeping things fresh. Night at the Museum: Battle of the Smithsonian has a talented cast. Ben Stiller, Amy Adams, Ricky Gervais, Hank Azaria, Owen Wilson, Bill Hader, Robin Williams and more round out this stellar ensemble, but almost all are wasted. The problem here is that there are too many characters, making it a bit too much to juggle when it comes to screen time. Bill Hader is a comic genius and plays his role as General Custer superbly, but for the majority of the movie, he's locked inside of a giant crate with a plethora of other characters, including Sacagawea (Mizuo Peck), who played a role as Teddy Roosevelt's (Robin Williams) love interest in the first film, but here recites a couple of lines and then falls to the wayside. The only major player that seems to be having fun in the movie is Azaria, who plays his character uniquely and humorously, providing one of the only major laughs in the entire film. There's a brief, two minute sequence in the movie with Jonah Hill who plays a security guard at the Smithsonian that is just great, proving his talent as a comedian, although much of it was spoiled in the trailer. And that's the story of this movie. While not a total drag, every mildly funny gag was ruined by the TV spots and theatrical trailers. Of course, the other jokes are basically rehashes of the previous movie anyway, including the slap fight between Larry and the monkeys. It wasn't funny in that one. It's doubly unfunny in this one. There's a moderately amusing 300 spoof during the climactic battle, but by this time, it was too little, too late. Outside of a couple of inspired moments of comic ingenuity, Battle of the Smithsonian is painfully unfunny, no doubt thanks to the writers, Thomas Lennon and Robert Ben Garant, whose writing resume is shameful, with stinkers like Let's Go To Prison, Balls of Fury and Herbie Fully Loaded forever attached to their names. Not being a fan of the original, I can't say I had high expectations for the sequel. The bar was set low. Surely it would be better. It wasn't. Night at the Museum: Battle of the Smithsonian is a bore and you'd be better off visiting the actual museum and learning something instead.